Show those strawberries you mean business. With more iPhone developers charging extra for their games, it's good to know we can still snag a bargain. 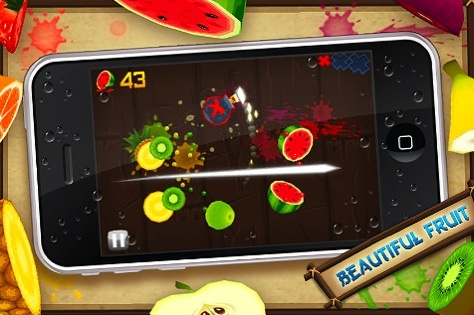 Halfbrick Studios' Fruit Ninja only costs a dollar and offers a few hours of fun. It lacks a compelling story and flashy graphics, but it's one of the few apps that we always come back to, thanks to robust online features and a simple yet well executed concept. As the title implies, Fruit Ninja casts you as a pajama-wearing assassin who trades slitting throats to slicing a variety of fruit. An unseen hand tosses strawberries, bananas, kiwi, mangoes and watermelons onto the playfield, and the goal is to chop as many as possible without missing any and avoiding bombs; hit one of them, and it's game over. You can only absorb three misses (the game erases a miss each time you reach 100), so it's in your best interest to keep your eyes glued to the screen. To play, simply drag a finger (we prefer using two thumbs at once) across the iPhone's screen. You can chop in any direction, so feel free to unleash a barrage of vertical and horizontal slices. What's especially cool about the game are the graphics and audio. While not advanced by any means, we appreciate the developers' attention to detail. They took the time to design the inside of each piece of fruit, then added appropriate sound effects so that you can tell the difference between a messy watermelon and a cleanly cut banana. Even better, some of juice splatters the background, sometimes in the direction you sliced. 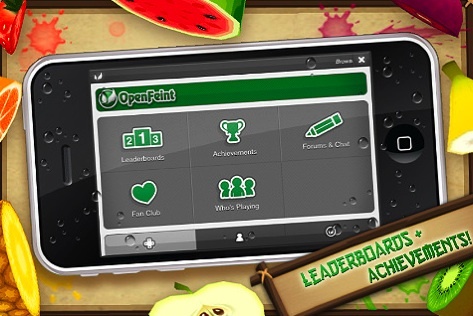 Although we would've played Fruit Ninja without online play, the OpenFeint support makes it even sweeter. The ability to compare best scores on the leaderboards (in general, against friends and random folks within your vicinity) push this game from curiosity to must buy. Unfortunately, there's only one mode, making Fruit Ninja a one-trick pony. But considering the price of the game and those advanced online features, we'll let it slide. Clearly, the best type of app is the one you can't resist playing and/or can easily play any time, and that being said, this game is worth every penny. What's Hot: Only costs a buck, addictive fruit slicing mayhem, colorful graphics, crisp chopping sounds, OpenFeint support, fruit facts. What's Not: Only one mode to play.